Ottawa can get cold. Really cold! You know it and I know it. Us Ottawans toss on enough layers come January to resemble a city of Stay Puft Marshmallow People. While cranking up the thermostat and throwing on the sweater/long johns combo will quickly bring you from sub-zero to heat hero, there’s a far tastier way to warm up your winter. While Mexico domesticated the little red palate warmers over 6000 years ago, nowadays China fires up the world’s dinner plates more than anywhere else. They account for nearly half of the world’s global total production of green chillies and peppers. To put things into perspective, that was 16.1 million tonnes of fire in 2015 to Mexico’s 2.7 million tonne flicker. We’re not quite sure when the chilli pepper made its way into The Great White North. Let’s just say around the same time as the first Taco Tuesday. Whenever that historical crossing was, it served to spark the flame that would see a flood of hot sauces move onto supermarket shelves. 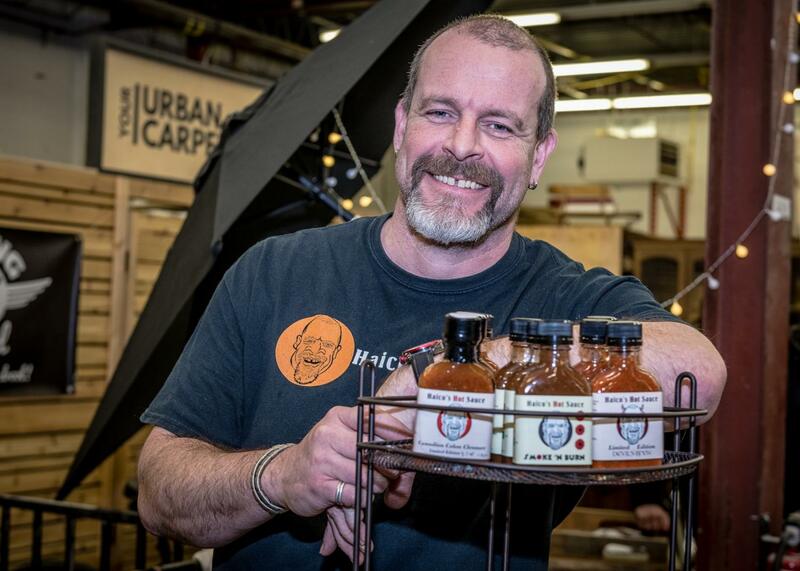 Like brewmasters have done with the craft beer craze, entrepreneurs like Doug Knight (Gringos Blazing Sauces), Penny Foster (Beckwitch), Larry Russell (Meow! 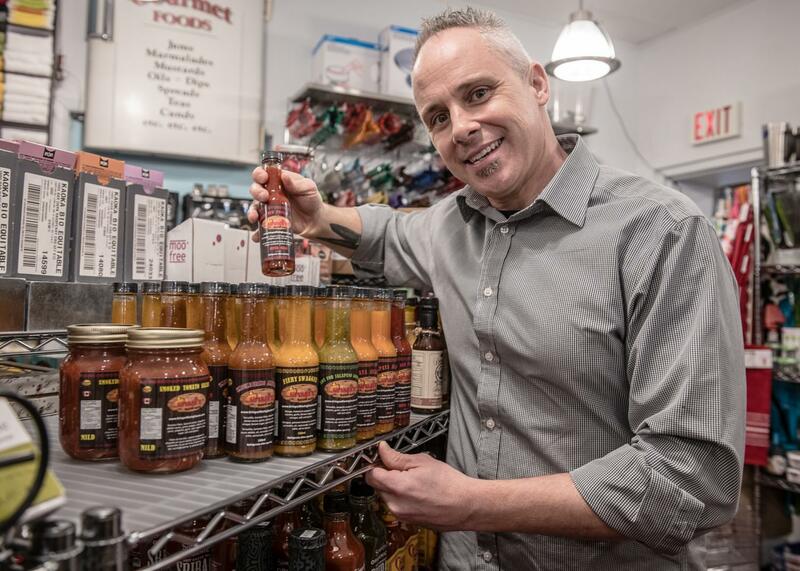 That’s Hot), Haico Krijgsman (Haico’s Hot Sauce), and Mike Raymond (Noisy Kitchen) have put their own tantalizing twists on hot sauces, introducing new tastes that should have you reaching for something local instead of a bottle of Frank’s Red Hot. Whether you’re a hot sauce lightweight or keen to spit fire Smaug style, here’s some O-town heat we think you have to try (bucket of water optional). Why did you get into the hot sauce business? Doug Knight: As a chef by trade my first passion has always been food and so I really missed cooking and wanted to do something creative! My fiance Laura loves hot sauce and I had a few recipes I had been working on so I started as a hobby and that was how it began! Now we have seven hot sauces, various salsas available and a smoked red pepper and jalapeno jelly! 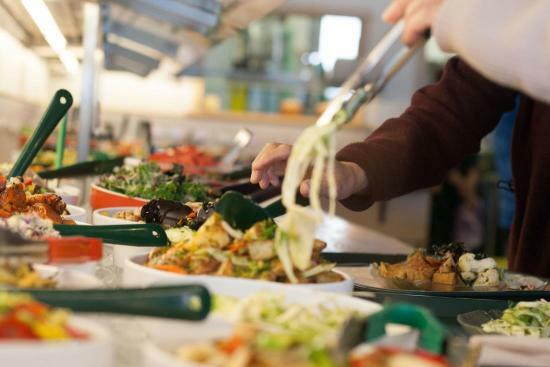 Our sauces are made from locally sourced quality ingredients using only natural and high quality ingredients! Creating these in small batches allows us to layer these amazing flavours. We pride ourselves in flavour always being first and we have all sorts of different heat levels to accommodate everyone's palate! Brie cheese with our smoked red pepper and jalapeno jelly delicious! Kitchenalia, Subito Sandwich shop, Mr Gas (Hazeldean) and our website. Why did you get into the hot sauce biz? Penny Foster: I have an obsession with pickling and preserving things. I can't stop! I won't stop! We are a small family farm and our products will reflect that. We aren't trying to compete but rather inspire and connect people to have a different and more intimate relationship with food and nature. We won't have piles and piles of produce at our market stand, but we are likely to have something unique that you've never seen or heard of before . Our love for all things that grow has ensured that we don't just stop to smell the roses - we eat them too! We are well known for our edible flower jellies, our nut free pestos, our ‘Holy Fawk’ line of spicy goodness and eating weeds, LOTS of weeds! 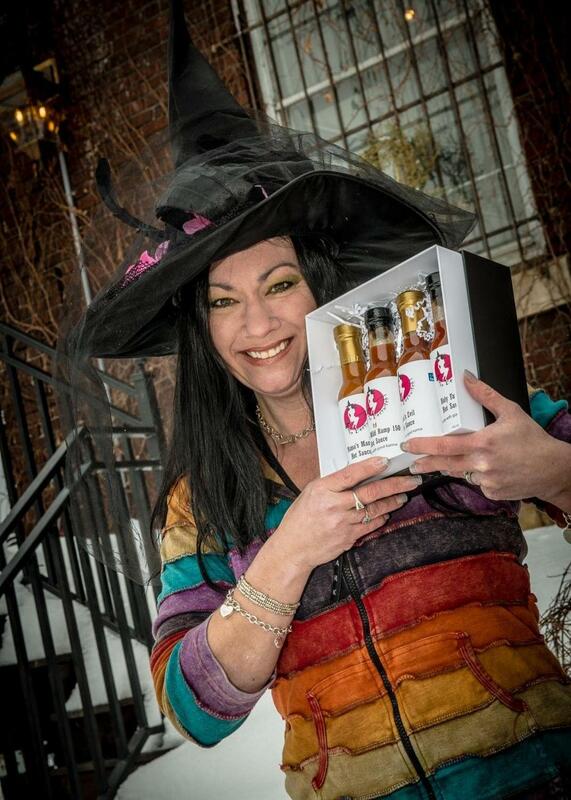 The Beckwitch hot sauces are unique as not only do we have some of the hottest hot peppers around, we also have some of the most unusual too! We grow mostly heirloom vegetables as such, we have hot peppers in every colour of the rainbow with a wide range of flavours. Some of our seeds and plants are very rare. Our limited edition hot sauces are also wild foraged. I'm a wild forager and use a lot of wild crafted ingredients in my products such as wild ramps, spruce tips, flowers, etc. Lastly, I also ferment hot sauces, mostly with unusual and unique ingredients such as kaffir leaves. 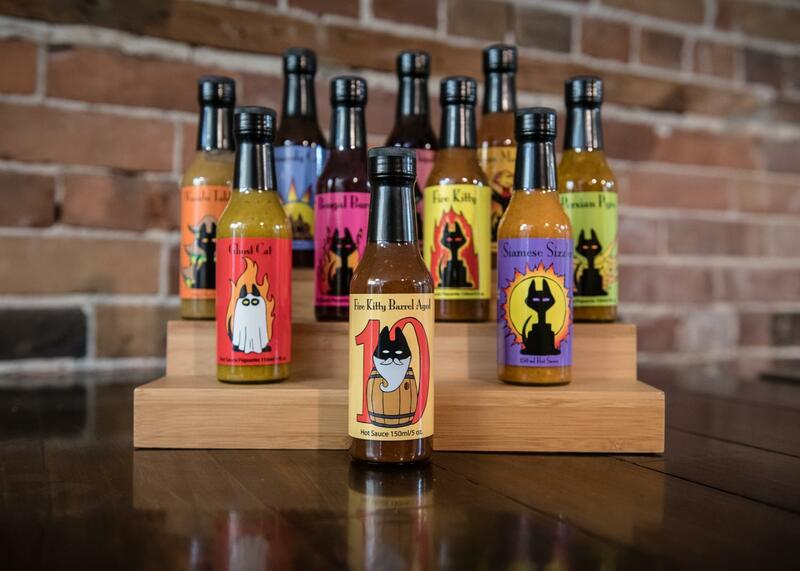 The Beckwitch hot sauces are versatile and can be paired with most any food and meal! We love to dip baked cauliflower in Maple Wild Ramp hot sauce, and Mama's Mango is usually paired at our table with poultry and rice. While Holy Fawk is used a bit more sparingly, but we like to sprinkle it EVERYWHERE! Bridge Street Summer Fest (Carleton Place), Perth Garlic Festival, Dickinson Days (Manotick), and our Market Stand at 522 9th Line East (Beckwith). Larry Russell: Meow! That's Hot was founded in 2007, while I was managing Il Piccolino and Il Primo, two Italian restaurants on Preston St. The house hot sauce at Il Piccolino was very popular, so the chef and I started the company and that sauce became our first sauce, Fire Kitty, an all-purpose apple and jalapeño hot sauce. Why you have to taste it? To celebrate our tenth anniversary, we took that first sauce and aged it in bourbon washed oak for ninety days, releasing only 1000 bottles of Fire Kitty Barrel Aged hot sauce. Each bottle is numbered, and this is a one time only release making it a great collector sauce for dedicated chileheads. The original Fire Kitty and the barrel aged version are both great for wings, pizza, eggs, and cocktails. Basically anywhere you would use Franks Red Hot or Tabasco. The Siamese Sizzler is perfect for stirfrys, or as a marinade, with up front citrus and ginger flavours. The Bengal Burn is our blueberry and blackberry hot sauce, great with poultry and game meats, or as a part of a cheese or charcuterie plate. Fire Kitty Barrel Aged is available direct from us, and from Chilly Chiles (our exclusive retail partner for this special release). 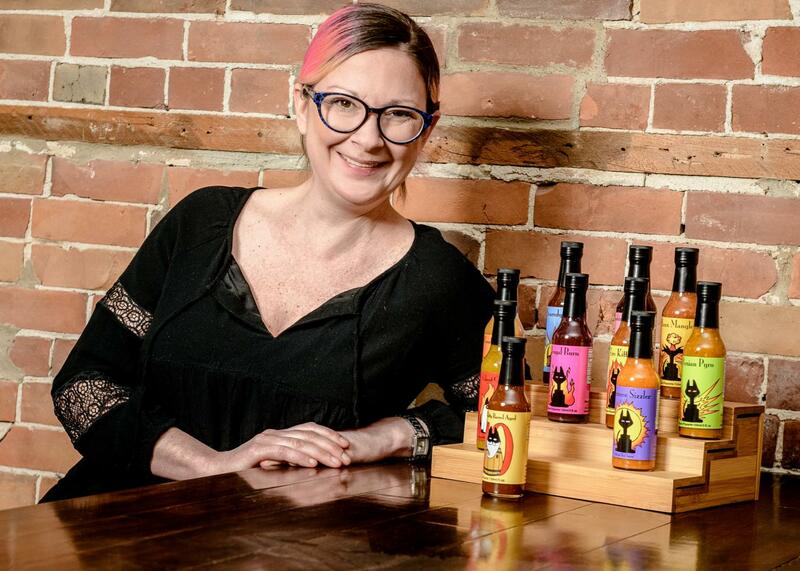 The original Fire Kitty and our other sauces are available at Farm Boy, Seed to Sausage General Store, Massine's Independent and many specialty food stores around town. Haico Krijgsman: I grew up in The Netherlands in a very multi-cultural environment. East Indian, Surinam, Indonesian and many others. This helped me to develop a taste for sophisticated spicy food at a young age. Once I moved to Canada I tried to find the same level of flavor and heat in the hot sauces and cooking in Canada, but to no avail. Disappointed, I decided to take over the world of hot sauce by growing my own ingredients (where possible) and making my own hot sauce. The result of this endeavour is an ever growing number of hot sauces varying in spiciness from mild to wild. All peppers and most ingredients are home grown in Ottawa by my wife, Angela and me. Any ingredients that cannot be grown locally, due to the weather (like peaches) are purchased on local farmer’s markets whenever possible. 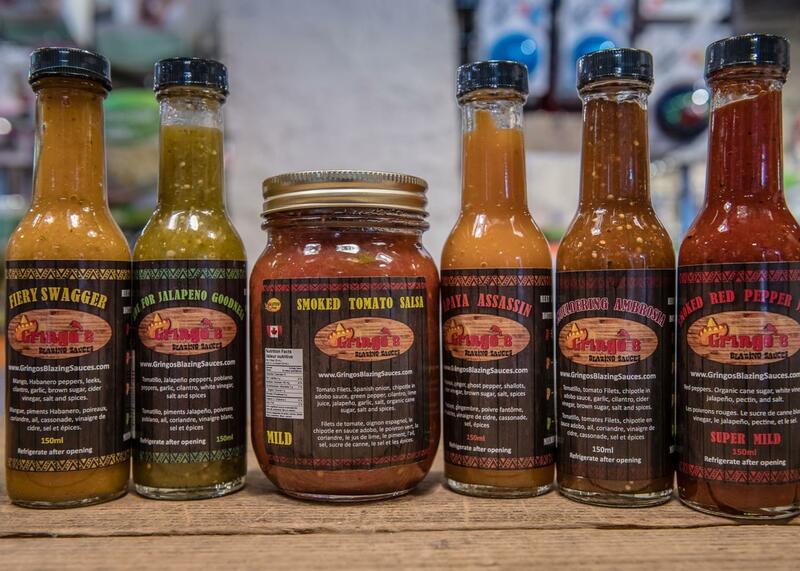 We use all natural ingredients and peppers that are grown in Barrhaven! How more local can you get! All the ingredients are locally grown or obtained. We combine flavor with heat, so there is something there for every peppehead! We have so many sauces, but to give you an idea: our honey mustard BBQ sauce is called a BBQ sauce but people have been using ut as a dipping sauce for ham, turkey and even incorporated it in salad dressing! Garlic Ghost goes well in garlic bread. Just one drop goes a long way. Really, Haico's Hot Sauce goes well on everything! Need to spice up your paste or chili? A drop of Scorpion's Kiss goes a long way. Need some zest to your burger or sausage? Use Mustard Menace! We are working on a cook book that will give you some great ideas on how to use the wide diversity of sauces available. 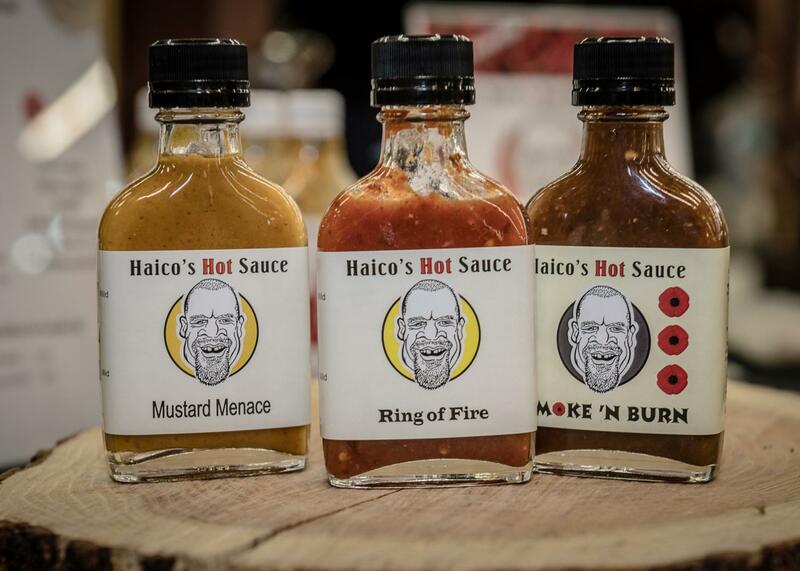 Haico`s Hot Sauce is available at several locations in Ottawa, Chilly Chile`s in Bayshore and Tanger outlets, Pete and Gus Butcher shop in Barrhaven, Cooke`s Fine Foods in Kingston. There are a total of 35 stores from here to Niagara on the lake that carry our product. We are als available online and ship all over the world. So far we have traveled the seven seas and have shipped even to Japan and Australia! 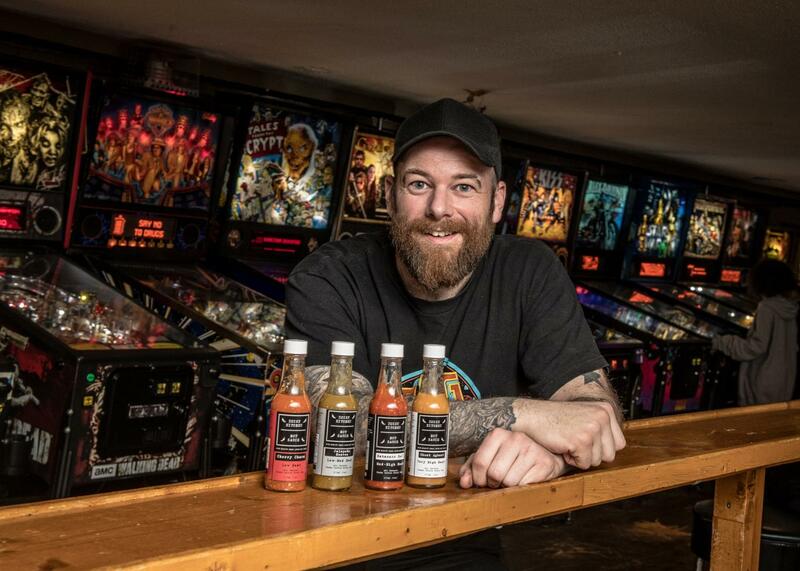 Mike Raymond: I got into to the hot sauce business by total fluke. Often making my own sauces when cooking at home, I decided one night to create my version of hot sauce. Since I ended up making way too much for myself, small containers of the sauce were brought for staff and regular patrons at my place of work at the time (Zaphod Beeblebrox). From that night on, there were constant requests for more of that original hot sauce. 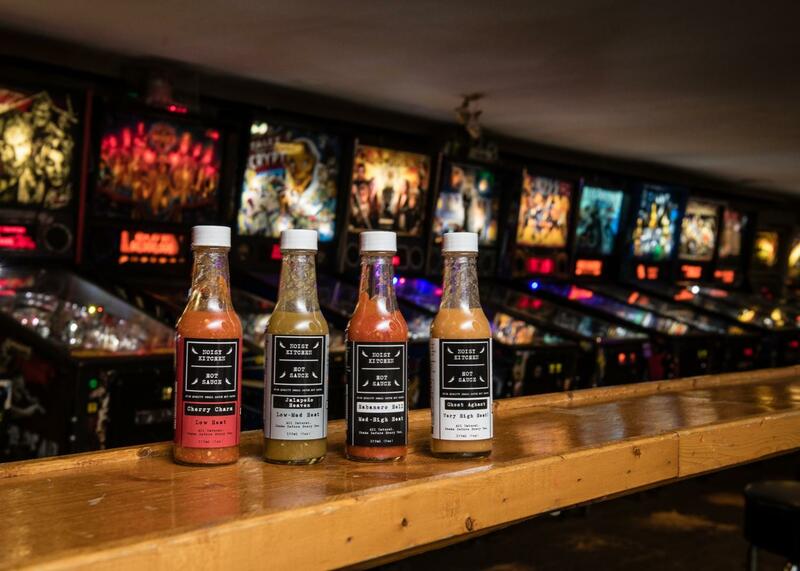 Since Chris and Ryan from Zaphods saw the potential, they let me sell it at the bar and things kind of snowballed from there, to the point where I had regular customers coming in just for the hot sauce. Word spread and the sauce made it's way into a handful of restaurants and stores in the ByWard Market without me even trying to put it out there. Next thing I knew I had a legitimate hot sauce company on my hands. People should try noisy Kitchen Hot Sauce to appreciate a hot sauce that really accentuates the taste of the actual peppers, It's always made with the freshest ingredients and not drowning in vinegar and salt like many commercial sauces. Try it on anything! Pizza, eggs, meats, sandwiches, pasta, potatoes, rice, soup, I even once put it in a salad and it was great. Seriously…anything! 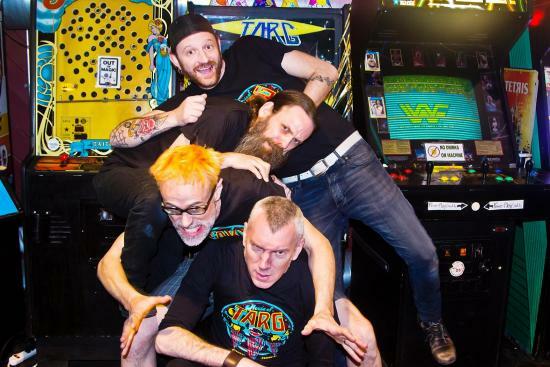 House of Targ, Market Organics, Zak's Diner, Level One Pub, or just Email us and we'll send you some. Woody’s Elgin Street Urban Pub is not quite like other pubs. There is a House in Ottawa South, They Call the House of Targ!